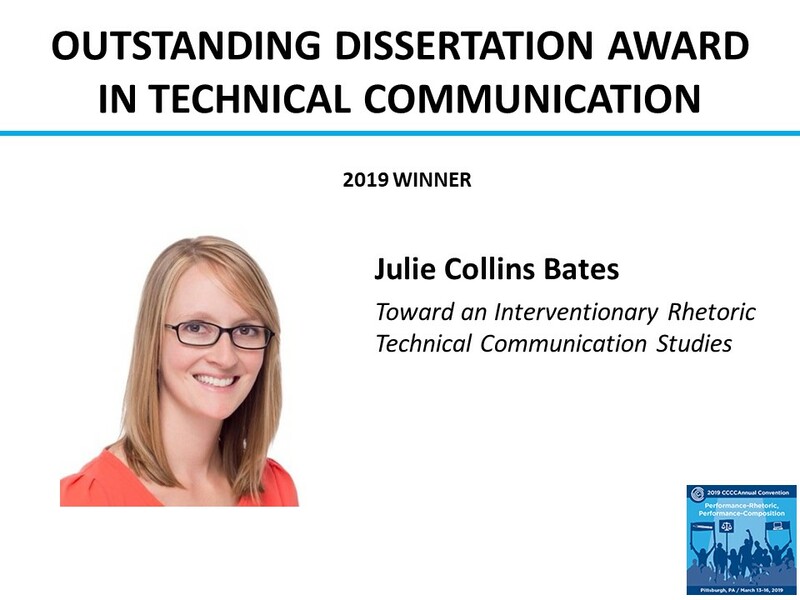 Purpose: The CCCC Committee on Technical Communication presents the Outstanding Dissertation Award in Technical Communication annually during the Awards Session at the CCCC Convention. Eligibility: Dissertations eligible for the 2020 Dissertation Award in Technical Communication must have been completed in 2018 or 2019. A dissertation may be nominated only once during its two-year period of eligibility. Award Criteria: Dissertations are evaluated according to the following five criteria: originality of research, contribution the research makes to the field, methodological soundness of the approach used, awareness of the existing research in the area studied, and overall quality of the writing. Award Specifics: Applicants must submit the following materials: (1) letter of nomination from a dissertation committee member, preferably the chair, emphasizing the significance of the research for technical communication studies; (2) an extended abstract (approximately 250 words); and (3) a copy of the dissertation. Send materials by October 15, 2019, to CCCC Administrative Liaison, cccc@ncte.org.